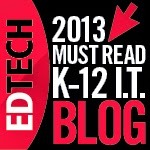 It's been almost a year since we published our post "Is 2012 the Year for an Educational (R)Evolution? ", and what did we get? For one, we got the Common Core standards being pushed into schools, and two, teacher evaluations based on student performance on standardized bubble tests. We live in a world of digital media, global brands, and 24/7 connectivity. The power of children to teach themselves using technology wields more capability than anything we might have imagined, and it exerts more pressure to change than ever before on the teachers, the schools, and the educational system. With the growing number of Massive Open Online Courses (MOOC) on the heels of higher education, the mounting use of resources such as Khan Academy, and the increasing realization that blended learning is no longer novel but necessary, we still see restrictions on the use of websites and devices by school administrations. Robin Sloan and Matt Thompson produced the Epic 2014 video in 2004 to predict the future of media. Aside from a few name changes, it is eerily close to the changes we've seen over the last eight years. This year Bill Sam wrote and narrated The Future of Education: Epic 2020. 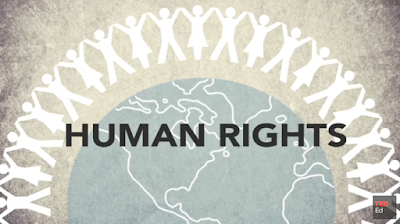 The video starts with the same opening line from A Tale of Two Cities by Charles Dickens, "It is the best of times, it is the worst of times." Instead of media, it predicts the future of education with the same melodious tone, taking the viewer through a strangely similar scenario that does not seem so far off, perhaps even fewer than the eight years of the earlier Epic 2014. Today's learner is different. It doesn't matter if you are only three and a half feet tall, you are a force to be reckoned with when it comes to education. Watch any toddler use an tablet; they swipe and touch with ease. s regular readers of this blog know, we've been fascinated for a long time with infographics as teaching tools. We like their interdisciplinary nature and their union of data and text to broaden students' learning. They also woo the eye with tantalizing designs that engage children in discovery. Until recently, infographics had saturated the business and blog communities but were late to most schools' curricula. In the past few months, though, more and more practitioners have adopted infographics into their teaching tool kits. 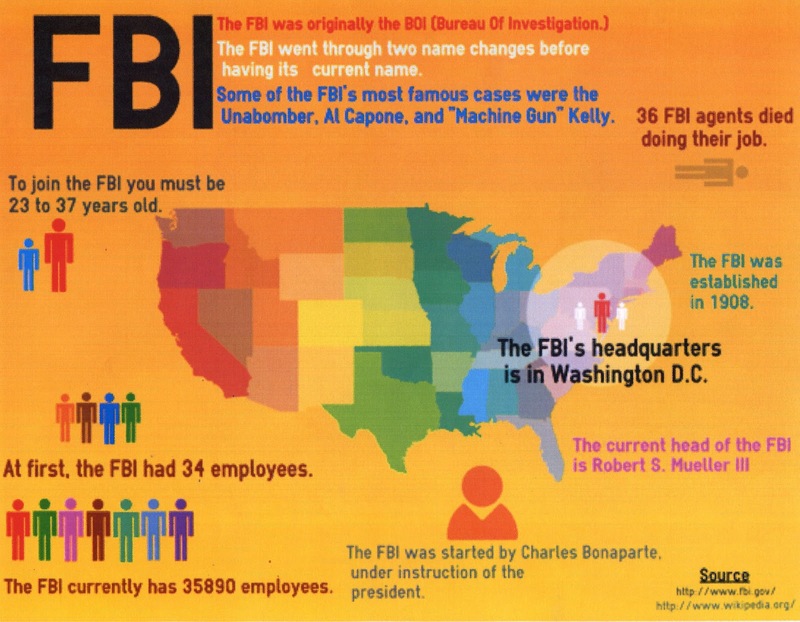 For ideas about using infographics in the classroom, check out these tips and suggestions. For extensive lists of infographics in every subject and discipline, browse this curated list. To see colorful examples of student-generated infographics, take a look at "Designing Infographics Easel.ly." Susan Riley at Education Closet also reinforces the value of hands-on artistry in her post, "Creating Infographics In The Classroom." She offers a clear tutorial video on how to produce graphics via the free online portal Easel.ly. Anum Hussain at the Hubspot Blog presents another painless method for creating images with his free downloadable template. 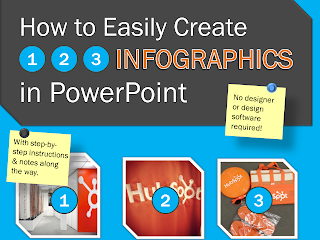 His guide provides three different types of easy-to-make, good-looking infographics using PowerPoint, which is familiar and accessible to most teachers and students. For more advanced experimenters, check out The Top 20 Data Visualisation Tools from Brian Suda at Net Magazine. Suda lays out the array of instructive resources, many of them free, ranging from professional applications to interactive GUI controls. Below, we've gathered together several Slideshare presentations about how various educators are approaching graphics in their teaching. Slideshare is a terrific, efficient resource for sharing PowerPoint and other linear media with viewers across the web. These slides offer approachable introductions to the possibilities of visuals in the classroom. Teaching with Infographics. 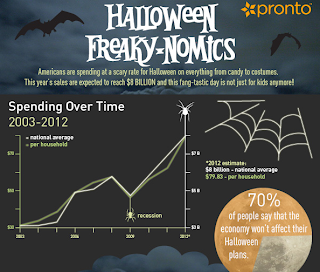 from Lisa Marie Johnson, Ph.D.
A year ago, we published our post about Halloween infographics. Since that time, the proliferation of infographics for all topics has grown in leaps and bounds, and with it a whole array of new visual treats has entered the pool. Halloween is revered by kids young and old. As teachers, it’s perhaps one of the hardest days to keep their focus, particularly for elementary and middle school students. For that reason, integrating these colorful, data-loaded infographics into lessons keeps them engaged and helps quiet the distracted. So here are a few of our new favorites. Oh, TheHorror! 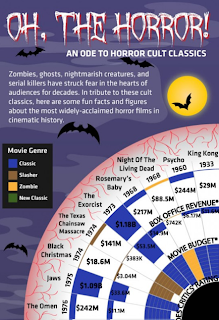 is a clever arrangement of popular horror films within a bloodshot eyeball. The radial chart includes the rotten tomato critics’ ratings, movie budget, and box office revenue. It’s great for lessons in the humanities, with crossover connections to economics and math. It could be a discussion opener for ranking current movies that relate to pop culture in the ranking, too. Of course no discussion about Halloween would be complete without candy. For this we recommend Trick-Or-Treat. 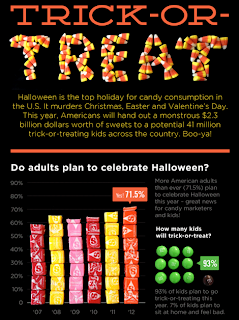 Kids will love the visual, candy bar charts using Starburst and Smarties. It’s a novel design to show the percentage of adults who celebrate the day, including the dollar amount they’ll spend on everything from cards to costumes. It screams math. Last but not least, take a look at HalloweenStatistics 2012 Creepy Calculations for ideas related to economics, social studies, and language arts. 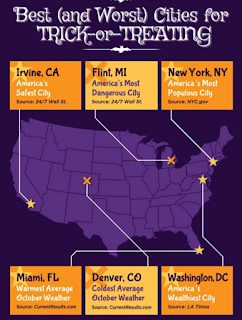 Find out facts about the best and worst cities for trick-or-treating, or the ranking of the most popular Halloween songs, films, books, and games. 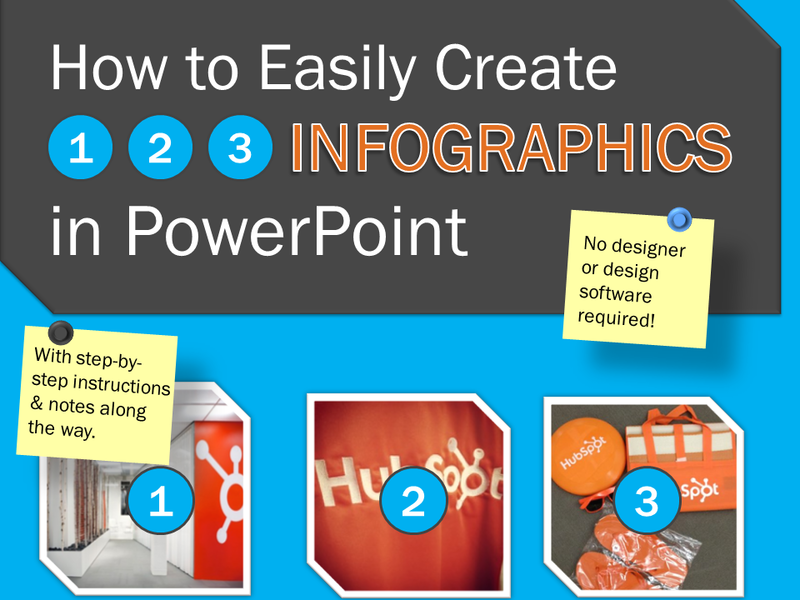 With all of these infographics, the learning opportunities are endless. They also afford a chance to compare the data for possible discrepancies in the information. Let's not forget the media literacy applications as well. Branding and marketing this holiday have pushed Halloween to be a major money-making industry, one that contends with other major holidays. We just returned from the 44th Annual Conference of the International Visual Literacy Association in Portland, Maine. This gathering created an exciting opportunity for top professionals from disparate disciplines to shape the evolving field of visual study. The IVLA conference was a balance between professors presenting traditional white papers and educators sharing new media. In talking to IVLA board members, we learned that by its own admission the organization is at a crossroads. The association is negotiating an identity crisis as it welcomes the emerging technological streams of visual information and still maintains its peer-reviewed, scholarly standing. We enjoyed getting to know new like-minded friends, such as Richard Emanuel, Associate Professor of Communication at Alabama State University, and we hope to stay in touch to exchange ideas and resources. One of the conclusions that became apparent in talking to our new colleagues is that for many academics, the ultimate definition of "visual literacy" is still a work in progress, notably in the ever-marching world of digital image interactions. A highlight of the conference was Friday's keynote address from Rob Edsall, Associate Professor of Geography and Earth Science, Communication and Digital Media at Carthage College. Edsall stressed that maps by definition are distortions of reality, requiring as critical a lens as text, and that iconographic "maps in the wild" reveal untold stories of power and culture. Another high point was the riveting talk from Patricia Search, former IVLA President, accomplished artist, and Professor of Language, Literature, and Communication at Rensselaer Polytechnic Institute. Search opened our eyes to the semiotics of space in new augmented-reality applications, which may be obstructing the very environments they seek to enhance. Thursday evening's tour of the Maine College of Art (MECA) introduced us to a fantastic, below-the-radar gem of a school. The high-ceilinged, beam-and-brick facility in a former department store offers individual spaces for students at work and emphasizes creative problem solving. We especially appreciated our conversation with President Don Tuski, who described MECA's efforts at keeping student costs low and involving the community in coursework. We would like to thank everyone who attended our presentations on "Visually Mapping Marks of Content" and "Designing Information: Infographics As Visual Literacy." We would also like to thank our gracious hosts at the Osher Map Library of the University Of Southern Maine, particularly Jeff Beaudry, Associate Professor of Educational Leadership, who in warm humor gave us first names when we needed them most. If you happen to be in the Portland area, we highly recommend dining among Old Port's cobblestones. Gritty McDuff's is still the best for a post-workshop ale, and Five Fifty-Five steams the savoriest cherry pepper mussels. The Old Port Sea Grill also prepares a meaty hake with clams, and both spots highlight the briny freshness of Maine's local oysters. A shout-out, too, goes to our buddy Vin and his mom, who played tour guides and made us feel like locals. 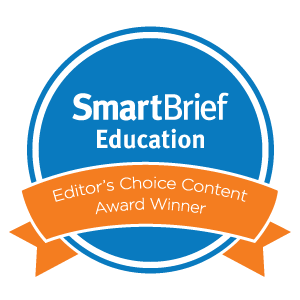 As schools increasingly look outside of their common cores to pinpoint skills for global competitiveness, they recognize the need to educate students beyond the written text. This curricular expansion can at times encounter uncertainty over instructional fads versus educational scholarship. 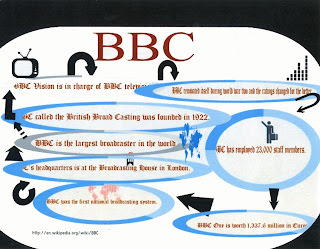 For example, questions occasionally arise about where the skills of graphicacy converge with the similar sounding terms of "visual literacy" and "visual thinking." Visual literacy is about learning how to look. It involves learning how to internalize and deconstruct the images that the brain sees. It involves input. Visual thinking is about learning how to design. It involves imagining graphic representations of new or traditional concepts based on the mind's unique creation. It involves output. Graphicacy, therefore, is the union of the two acuities. It marries the essential skills of decoding and encoding to embrace a range of pictorial proficiencies. Due to technology and media, today's visual kinetics demand a firm grounding in the illustrative arts. In "Just In Time For Big Data: Graphicacy Levels On The Rise," Anne Milley of the International Institute For Analytics reinforces the need for graphicacy skills amid the burgeoning age of "Big Data." She emphasizes that data visualizations typically require more analysis (and, therefore, more training) than information visualizations. She acknowledges, "it is good to see that we are poised to take greater advantage of our amazing visual bandwidth through more graphic encoding of data." The charts and graphs that Milley champions have been key mathematical tools for generations, but they have not always made their way into other disciplines. Today's infographics, for example, sometimes blur the line between "pure" data charts and what Edward Tufte derides as "chartjunk" (i.e., unnecessary ornamentation that serves no communicative purpose). A 2010 white paper out of the University of Saskatchewan, however, pushes back on this notion of visual purity. "Useful Junk? The Effects Of Visual Embellishment On Comprehension And Memorability Of Charts" (Bateman, Mandryk, Gutwin, Genest, McDine, & Brooks) suggests that the cleanest form of data design may not always be the most useful. This thesis gently insists that elaborations to stark graphs do offer value. For example, there is a difference between a standard bar chart of corporate earnings and an infographic of McDonald's annual revenue depicted as a series of french fries sticking out of a container. The first focuses solely on the raw numbers, while the second combines the data with branding associations, visual mnemonics, color and logo cues, and even emotional connections. This excellent slideshow from Andy Kirk of Visualising Data reminds us above all else why graphicacy matters. In "The 8 Hats of Data Visualisation," Kirk recounts the design process and the mindset of creating great graphics. 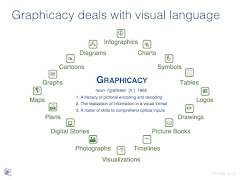 For more information, please check out our other posts on graphicacy. Even though it’s an OMG, LOL and BFF world, it doesn’t mean that kids know the meaning of acronyms. Yet, because they are so commonplace and often not defined, many students don’t know what the abbreviations stand for in things they read or hear. This is why at the beginning of the sixth grade we work on identifying acronyms from newspapers such as The New York Times and The Wall Street Journal to increase kids' abilities to be news literate. 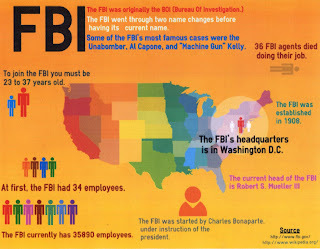 This lesson also makes for a perfect segue to build in opportunities to create infographics. For the content, the students used Wikipedia in conjunction with host websites for government agencies. What worked out great for this project was the basic information and data listed on the Wikipedia page just above the contents box for each article. It provided enough background content for the infographics. They used this information, in combination with the graphics in Easel.ly, to create the samples in this post. Reading or listening to the news can be difficult for students to gain an understanding if they are not familiar with acronyms. They tend to view them as words rather than a shortened form for something else. Let’s not forget the media literacy component, too. For example, TARP was used in the media to soften the association with a dire situation. Referring to the financial crisis as TARP rather than the Trouble Asset Relief Program played better in the news; it was less of a reminder as to why TARP was created. In doing this assignment, the students collected close to 40 different acronyms that were newsworthy. We also limited the number of sports leagues and news organizations on their lists. They tried to locate the actual names in the articles they were perusing in the newspapers, but many times they were not identified. 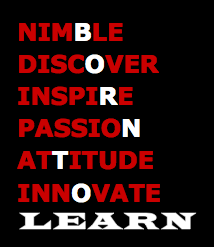 To find the rest, they used Acronym Finder on the web. Even this was an eye-opener for many of the students. The website ranks the most widely used version of each acronym. Occasionally, that was not the case, requiring more skill in reading the results to distinguish which one fit the criteria for the class. 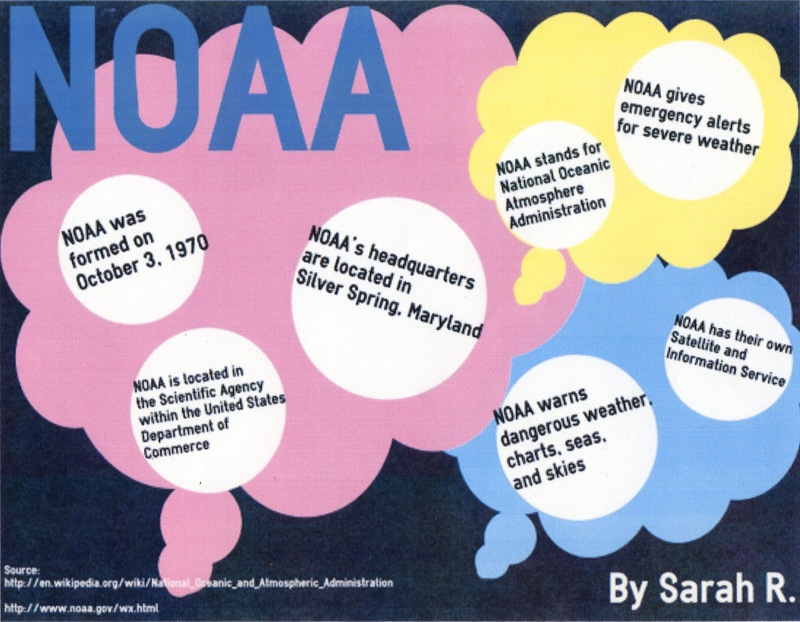 All in all, discovering the meaning of different acronyms enabled the students to develop a better understanding of what they mean, to recognize their frequent use in the news, and to gather information, graphics, and data for designing infographics. This week, we are teaching our students how to create charts. On a higher level, we are also helping them realize the benefits of graphs in discovering stories hidden within data and in demonstrating opinions through visualizations. Guiding kids to decode illustrated data can result in a life-long skill, vital for their future budgets and 401ks. But freeing them to make graphs on their own can also unlock the perceived mysteries behind scientific displays. 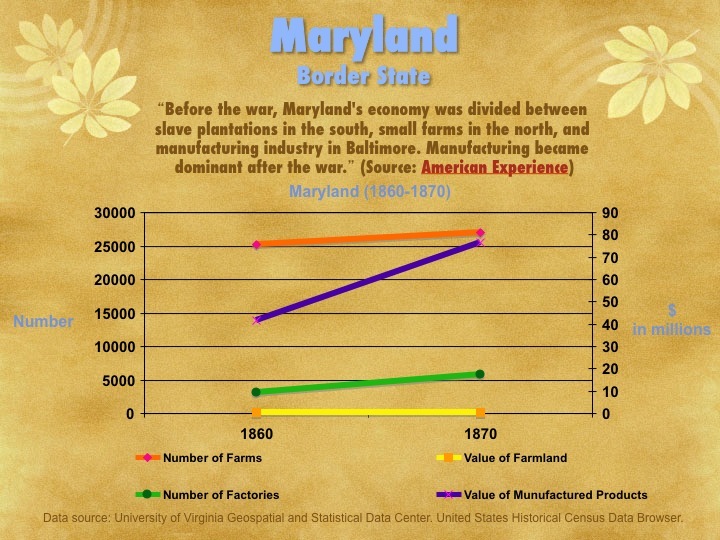 Whether digital or paper-based, student-designed charts can be great cross-curricular tie-ins between social studies and math, good for any grade level. Elementary learners can create pie graphs to show fractions. Middle school algebraists can practice their slopes and x/y intercepts. High school economists can plot variable cost curves and production possibility frontiers. In teaching about primary source data and Excel models, we like to incorporate the "Taxonomy Of Graphs" as a visual guide to the different types of displays, from the literal to the abstract. We also like to let children explore the many online sites for quick graphic generation. A terrific video to make kids smile and introduce the broad world of graphs comes from Sid The Science Kid on PBS Kids. The catchy musical clip, entitled "I Love Charts," has been shared by several sites thanks to its catchy jingle and educational value. As an example of an in-class lesson, we did a quick one-day exercise with our eighth-graders to explore the regional changes in agriculture and farming after the Civil War. Using data from the PBS American Experience site, "Reconstruction: The Second Civil War," our students produced graphs of each state to reveal transformations in the number and value of both land and manufactured goods. Even while cataloging numbers and formatting line graphs, the students were thoroughly engaged, tweaking their layouts and choosing colors and designs. They also added hyperlinks to their images so classmates could click directly to the source. 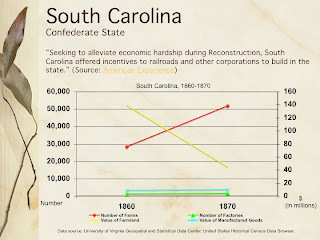 Another trouble-free lesson in chart creation comes from Glenn at History Tech. We followed the excellent suggestions in his blog post and invited our students to debate in small groups the relative weight of three Civil War causes. 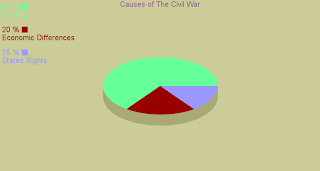 They discussed for several minutes and then made simple pie graphs on the free online tool Pie Color. Finally, each team displayed their graph on the SMARTboard, justifying their percentages to the rest of the class.